We’re the children of the Ice Ages. About the time genus Homo appeared 2 million years ago or so, the Ice Ages started. Cycles of glaciation and partial warming started up. We tend to only talk about the last glaciation as the “Ice Age”. Civilization has only developed in the past 10,000-12,000 years in a period of relative warmth and stability. We don’t want it too cold or too hot. Unfortunately, we’re pushing things over to the warm side by adding measurable amounts of carbon dioxide (CO2) and methane (CH4) to the Earth’s atmosphere. Those are the most important “greenhouse gases”. The greenhouse effect is what keeps the Earth habitable. Visible and some ultraviolet light pass through our transparent atmosphere and strike the surface of the Earth and whatever is on the surface. The light excites the atoms it strikes and those atoms radiate infrared light; heat. Many of the gases in the atmosphere, especially CO2 and CH4 are NOT transparent to infrared. They hold the heat in. Without the greenhouse effect, heat would escape to space too quickly and the Earth would be more like Mars; very, very cold. But we’re balanced on a knife edge. A bit too much greenhouse effect and enough heat gets stored to change the Earth’s climate. It’s happening so quickly that it’s hard for us to adapt. If the Greenland ice cap melts in the decades to come, sea levels could rise more than 20 feet. The land where millions of people live will be under water. The melting of the main Antarctic ice cap would be worse, much worse. And many people, myself included, think that as the ground, water, and air store more heat, the effect will provide more energy for the churn of our Earth’s atmosphere. That means more violent and unpredictable weather in addition to warmer temperatures overall. And patterns will change. Some places will get more moisture. The desert American Southwest where I live is predicted to get drier. Here’s Lake Mead behind Hoover Dam; the water is dropping. The climate is getting hotter, more unstabile, and nastier just as the cheap energy that powers our emergency response to disasters gets expensive. Not a good combination. And it’s potentially even worse. In the long run, we’ll run out of fossil hydrocarbons that are feasible to extract and burn. But in the short term, as easily recoverable hydrocarbons become scarcer, we still have vast quantities of “unconventional” sources of gas and oil, and lots of lower grade coal. Let’s examine the greenhouse gas potential of each of the energy sources. To extract the thicker oils from tar sands in Canada or lower grade crude in California’s Kern County, oil producers burn natural gas to produce steam to soften and transform the thick tar-like oil into usable form. The World Wildlife Fund reports that that works out to 188 pounds of CO2 released in the extraction of a barrel of oil, versus 63 pounds for a barrel obtained from a conventional oil well extraction process. Burning a barrel of oil produces about 946 pounds of CO2. So a barrel of oil extracted from the tar sands and burned as fuel adds at least 12% more CO2 to the atmosphere than is obtained extracting and burning a barrel of good Saudi Arabian crude oil. The 170 billion barrels of oil estimated to be extractable from the tar sands could conceivably add 96.4 billion tons of CO2 to the atmosphere versus 85.8 billion tons of CO2 from the conventional reserves of oil, where production is on the decline. And there are actually 1.7 trillion barrels of “bitumen in place” in Canada. As oil gets more valuable and expensive, even more could be extracted with more effort, and likely even higher CO2 production cooking the bitumen. Natural gas produces significantly less CO2 when burned than oil or coal for the same amount of energy produced, which sounds like a good thing. However, natural gas is almost entirely methane. Depending on what source you cite, methane is 10 to 25 times as potent a greenhouse gas as CO2. In fact one of the higher claimed ratios, 21, is on the natural gas industry’s own website. The EPA rates it as 20 times worse than CO2 in terms of the effect a pound of methane would have compared to a pound of CO2 released into our atmosphere over 100 years. As conventional oil production really begins to decline, or even as demand exceeds supply before the real decline starts, natural gas will be used more and more as a transportation fuel. In fact, General Electric will sell you a natural gas retrofit kit if you have a diesel locomotive. Notice in the U.S., natural gas is quite a bit less expensive than oil for the equivalent energy content at the moment, although part of that is because its use in place of coal and oil is still ramping up. 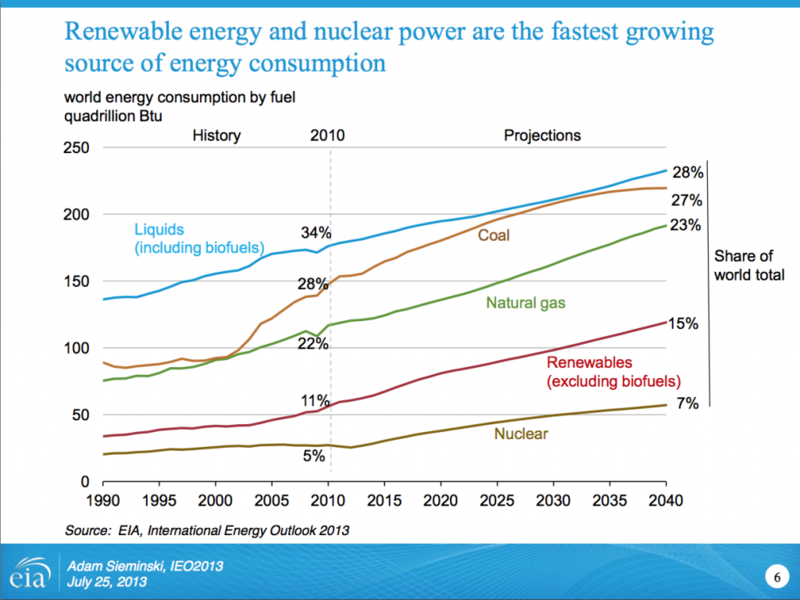 It’s already being used more and more as an alternative to coal to generate electricity. So while natural gas only produces 65% of the CO2 that oil does when burned, any significant leakage from extraction and distribution systems could make the net greenhouse effect just as serious as the effect from burning oil. In fact, taking a worldwide leakage estimate of 3.2% and the lowest end of the effect range, a factor of 10, gives a 32% increase in greenhouse effect, almost a wash with oil. At a factor of 25, it’s way worse, about 1.5 times the greenhouse effect of burning oil. It’s hard to imagine we won’t burn as much natural gas as we can extract for the foreseeable future since there are as yet no serious alternatives. In this country, there’s been a drilling boom for shale gas using hydraulic fracturing techniques. It turns out that method may have a leakage rate of 8%. That would be much, much worse than the effects of burning oil or coal. There are truly vast amounts of methane stored in the earth’s crust, either in layers of rock or in a colloidal icy form in permafrost and continental shelf methane hydrates. And there are serious efforts under way to tap those methane hydrates. And then there’s coal. Burning coal produces quite a bit more CO2 than either natural gas or oil. 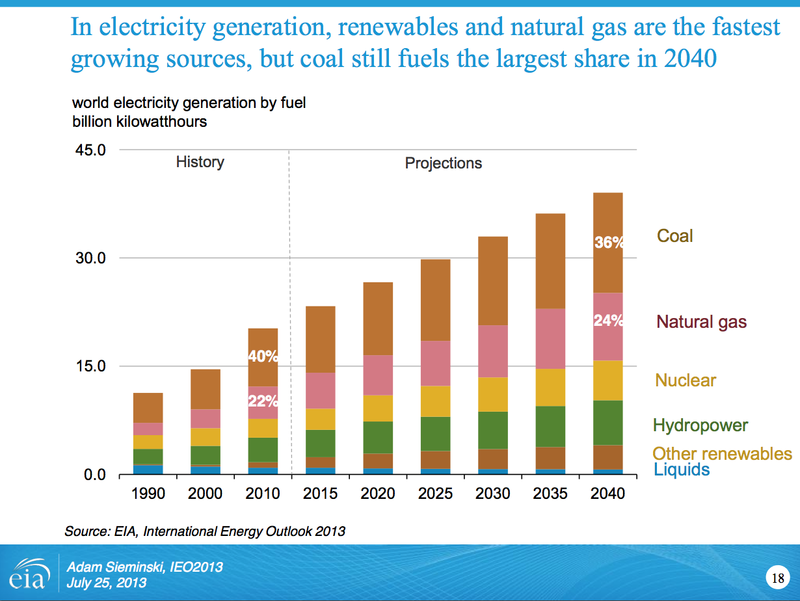 Here’s the Department of Energy’s Energy Information Agency’s projection of coal consumption, included in a graph of electricity production, from their 2013 International Energy Outlook. That’s a lot of coal being burned. If this scenario is close to correct, there’s nothing here to decrease CO2 production. Quite the opposite. Notice that even though the figure title refers to growth of renewables and nuclear power for electricity generation, everything except coal use is growing dramatically. To obtain those growth rates in hydrocarbon-based fuels (Liquids, coal, natural gas) there needs to be an awful lot of extraction from unconventional oil and gas sources like the tar sands and the shales. The UN University claims high quality coal production peaked in 2011. Lower quality, more carbon producing coal would need to be dug up and burned. This figure was produced before the impact of the Fukushima Daiichi nuclear disaster was factored in. The Japanese have shut down their nuclear reactors and have gotten very interested in the continental shelf methane hydrates. While many people are sounding the alarm with regard to global warming and climate change, all the conventional projections of energy consumption and greenhouse gas production I’ve seen go in the wrong direction. And if the vast reserves of methane hydrates we’ve discovered along the continental margins can be successfully tapped, gigantic quantities of greenhouse gases will be produced for decades, perhaps centuries to come. That’s very much the view of William Ruddiman, who presents evidence for measurable human contributions to greenhouse gases since agriculture began. In his Scientific American article he takes the pessimistic view that we will burn what’s burnable until it’s gone. For the moment, I see nothing to counter that perspective. Before I leave this topic, I should also point out that these projections assume some sort of continuation of economic growth. When the global recession hit and some economies shrank, hydrocarbon consumption did decrease in those economies. That would be mostly the United States and Europe. But in the developing nations, growth continued. Jeff Rubin suggests in his book Why the World is About to Get a Whole Lot Smaller, that those economies can absorb higher energy costs up to a point. Because of growth in China and elsewhere, even though developed nations produced less greenhouse gases, worldwide production still rose by 2% in 2008. In his latest book, The Big Flatline, Rubin argues that economic contraction will decrease greenhouse gas production, not the warnings of climate scientists. Economic contraction is a “be careful what you wish for” prospect. That combined with crushing public and private debt could cripple our ability to respond and move forward. At the individual level, there’s an inherent incongruity in warnings of dire consequences caused by our normal activities. Over 7 billion people are trying to lead their lives. No sane person wants to make their world unlivable. Warnings of deleterious effects that are the aggregate of the normal activities of day to day life are at best hard to connect to, and at worst can be interpreted as berating people for leading their lives. Even educated, environmentally aware people who want to reduce their footprint find it difficult. I drive a Prius, we have a solar array on our house, and I’ve been known to bike commute. Our net carbon/methane footprint is still huge compared to the average family in most of the world. As the situation gets more dire, there will be a tendency to grasp for apparent solutions, even if those solutions are environmentally unsound. Jeff Rubin warns that unless environmentalists learn to grasp the larger issues and devise enlightened self-interest arguments to present to the public, they will likely be ignored. Those arguments should focus on helping people understand how supporting reduced hydrocarbon fuels consumption can help their daily lives.